For most gardeners, nothing compares with having your own freestanding greenhouse. You find yourself with the uninhibited ability to grow year-round plants, flowers, vegetables and herbs. The weather is no longer a threat or an impediment to your gardening passion. 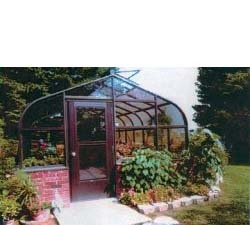 The Grand Hideaway Greenhouse allows a gardener to reach their fullest potential, and its unique and aesthetically pleasing shape will bring an enchanting quality to any landscape. Its round eaves are not only for beauty but functionality as they deter snow piling, and the advantage of strong, aluminum framing and 1/8" tempered glass are featured in all Grand Hideaway greenhouses.